Some of today’s youth never learned etiquette growing up. This is a sad truth that our schools don’t teach proper comportment or how to cross your ankles when sitting or even how to cross a crosswalk without being a total douchebag. So today’s lesson, kids, is how to cross an intersection safely while at the same time respecting the time and space of everyone else either walking or driving on the planet as yourself. Because, my sweet little snowflake, it isn’t all about you. So, it really is very simple… once you have stepped into the road, proceed with alacrity to the other side. This is not the time to saunter, dawdle, or lollygag about. There are cars waiting to go. Just because you, as the pedestrian, have the right away doesn’t mean that you shouldn’t respect the others using the roads. And while you are at it, give the nice people in the car a friendly wave. After all, they are not currently running you over, even though they may want to. Courtesy is its own reward. 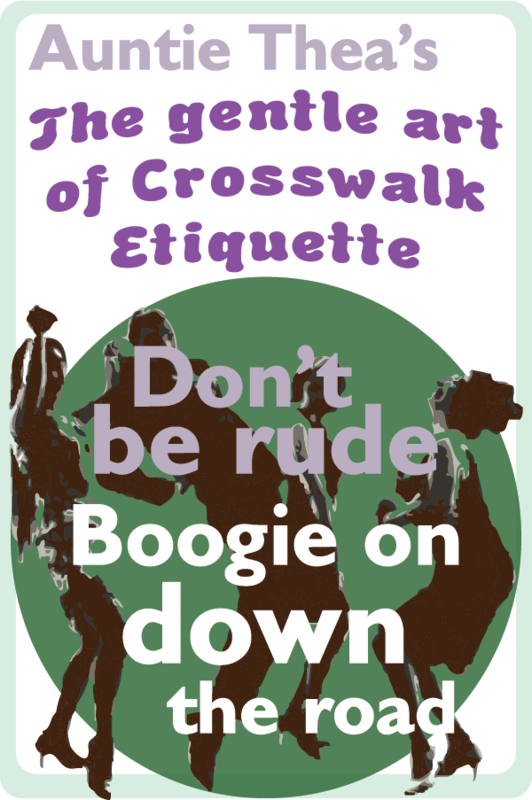 So a simple rule of etiquette when crossing the street, is to boogie on down the road and get the traffic moving again.